African American historian and civil rights activist W.E.B. 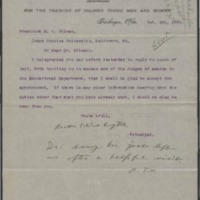 DuBois corresponded with Gilman regularly, with his letters appearing in the collection under his own name as well as in files on the Atlanta Exposition and the Slater Fund. DuBois’ history with the Exposition is well-known, but it is his involvement with the Slater Fund that the Gilman correspondence files bring to light in new ways. The John F. Slater Fund for the Education of Freedmen was created in 1882 to aid the rebuilding of the South and the advancement of African Americans through education. Gilman, who was already the president of Hopkins, was chosen as a founding board member and became the Fund’s treasurer. DuBois was one of the early recipients of a Fund scholarship, using it to study abroad at the University of Berlin. His correspondence with Gilman provides rich detail of this period in Du Bois' life, a foundational phase for his many accomplishments to follow. Gilman’s correspondence also illustrates a relationship with the educator and civil rights activist Booker T. Washington. 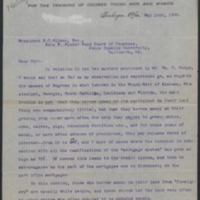 Gilman's correspondence with Washington includes letters in which the latter asks for help in establishing Tuskegee, calling specifically for advice on classes and structure, but also requesting the use of Gilman’s name on pamphlets for fundraising and political support. One major show of support Gilman gave to the educational career of Washington was in asking him to be a juror of educational exhibits at the 1895 Atlanta Exposition. Gilman’s invitation came shortly after Washington’s historic “Atlanta Compromise” speech that was a major turning point in African American history and politics. In his speech, which would prove to be a political dividing line between he and DuBois, Washington advocated a slower, less revolutionary path to African American equality. Prominent black leaders such as DuBois publicly objected to the arguments put forth in the Altanta Compromise. Daniel Coit Gilman served as Chairman of the Cotton States and International Exposition, where Washington delivered the speech. Booker T. Washington letter to Daniel Coit Gilman, 1895. 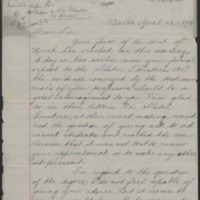 Letter from Booker T. Washington to Daniel Coit Gilman, 1895. Daniel Coit Gilman letter to W.E.B. Du Bois, 1894.